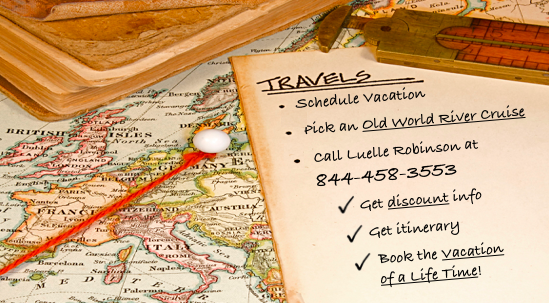 Let Luelle Robinson help you schedule your dream vacation. As a specialist in Old World River Cruises, her professionalism and expertise can make all the difference when it comes to choosing the perfect destination and itinerary while getting the specials and extra value to make your experience both affordable and memorable! Contact Luelle by email or by calling toll free (844) 4 Luelle, that’s (844) 458-3553 to inquire about current specials and group promotions to your dream destinations. Questions concerning a certain ship? Need help deciding on a stateroom or suite? Maybe you’re planning to extend your stay and would like to know more about excursions and additional destinations. We can also assist with airline reservations and accommodations before and/or after your cruise. In fact, Old World River Cruises is a full service agency ready to meet all your travel needs.